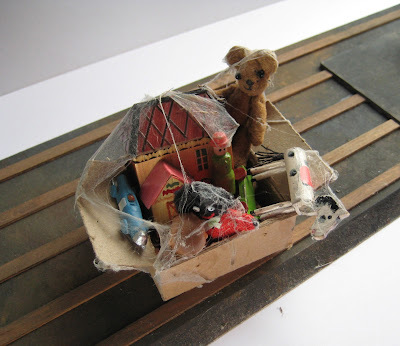 My dolls house kit (and caboodle): Oh, what a tangled web . . .
Oh, what a tangled web . . . The box of toys has finally been assembled for the loft, including the mini baby doll I had mislaid earlier. Rather than blow dust over the arrangement, I wanted to try the cobwebbed effect. It seemed logical to use genuine spiders' webs and so I set out for a prime source - the festoons hanging inside the windows of our garden shed. I made a loop of wire and harvested what I thought would be enough, keeping a wary eye open for any spidery movements. Not that I'm particularly scared of them but I am very allergic to being bitten (don't let anyone tell you we have no venomous spiders in the UK, I was sensitized by a harmless-looking little number that crawled out of a bag of grapes). The initial problem was carrying the web material back up to the house in a keen easterly wind. Of course, it promptly wrapped itself around the wire. Once indoors I had to tease the stuff apart in order to spread it over the toys. I was surprised it didn't disintegrate, quite the contrary, it's really tough and has a lot of stretchability. So here's the result. It's only an experiment, I could try teased-out cotton wool instead. Or perhaps I'll just leave the toybox down in the shed for a few weeks and let the spiders deal with it all by themselves. Thanks Monique, I'm honestly surprised that the experiment worked so well. To date, the cobwebs have survived OK, as for a realistic layer of dust - well, I only have to leave the box somewhere around the house to collect it quite naturally! Glad you like it Christine. There's something quite poignant about abandoned toys - but hey, these guys should be glad, they've got starring roles in the loft after all - and it was only a web transplant, no toy was actually touched by a live spider!